USINDO Open Forum March 14: Indonesia’s Presidential Elections: What Do the Latest Polls Show? What Do the Latest Polls Show? Indonesia’s holds its Presidential and Legislative elections April 17. For President the contenders are (a) incumbent President Joko Widodo with Vice-Presidential Candidate KH Ma’ruf Amin; and (b) Presidential candidate Lt. Gen (Ret.) Prabowo Subianto with Vice-Presidential candidate Sandiaga Uno. Each contending team leads a broad coalition of political parties. Legislative elections are held the same day. 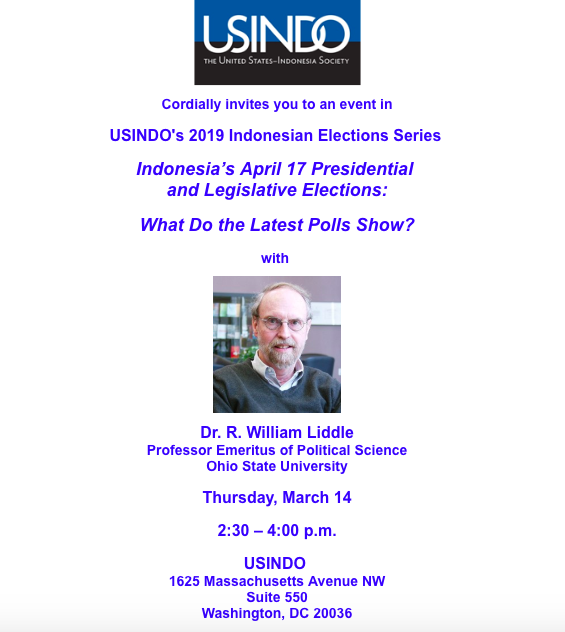 USINDO is delighted to host Dr. Bill Liddle, distinguished American political scientist and Indonesia expert, on Thursday March 14, to enhance our understanding of this important election. Dr. Liddle will brief us on the latest polling results and trends from Indonesia, interpret them in his view, and be exposed to our audience’s questions. This event will inform us about what current polls in Indonesia show, while keeping in view that political polls are imperfect and poll results change week by week. Please join us on March 14 for this important event. To register, please RSVP HERE as soon as possible, and not later than 4:00 pm March 12. Biographical Information: Speaker R. William Liddle is Professor Emeritus of Political Science at Ohio State University and a specialist on Southeast Asian, particularly Indonesian politics. He has conducted research in Indonesia on many occasions since the early 1960s and has been a Fulbright researcher and lecturer in both Indonesia and Singapore. He writes for the international and Indonesian media, including The New York Times, International Herald Tribune, Wall Street Journal and Asian Wall Street Journal, Jakarta dailies Kompas, Koran Tempo, Media Indonesia, Republika and the national Indonesian newsweekly Tempo. He received his Ph.D. in political science at Yale University in 1967 and has taught at Ohio State since 1965. Professor Liddle’s publications include Voting Behavior in Indonesia since Democratization: Critical Democrats, Cambridge: Cambridge University Press (with Saiful Mujani and Kuskridho Ambardi), 2017; Piety and Public Opinion: Understanding Islam and Political Behavior, Oxford: Oxford University Press (with Thomas Pepinsky and Saiful Mujani), 2017; and “Improving the Quality of Democracy in Indonesia: Toward a Theory of Action,” Indonesia 96, October 2013. On December 12, 2018, the Indonesian Government presented Dr. Liddle the Anugerah Kebudayaan award, Indonesia’s highest cultural award for a foreigner, granted by the Indonesian Ministry of Education and Culture.